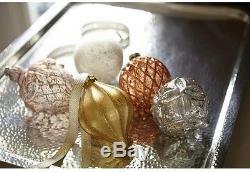 Martha Stewart Living Holiday Shimmer Glass Ornament Set (50-Count). 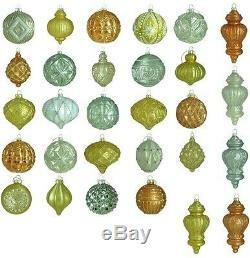 This amazing Holiday Shimmer Glass Ornament set will make holiday decorating a snap. Featuring a palette of earthy, metallic hues, brassy gold, titanium and copper, the Holiday Shimmer Collection blends shiny, smooth and sparkle finishes to give your tree that unique look for the season. Add this ornament set to your own collection and select items from the same collection to create your own custom look this Christmas. 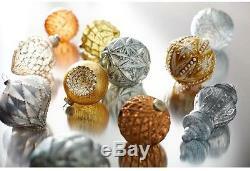 Pack of 50 assorted different sizes balls and finials. 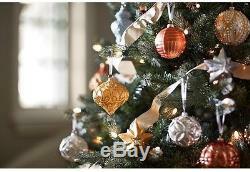 Adds a unique, festive feeling to your holiday tree. View More from the Holiday Shimmer Collection. Gold, Copper, Silver & Titanium. The item "Martha Stewart Living Holiday Shimmer Glass Ornament Set (50-Count)" is in sale since Monday, June 26, 2017. This item is in the category "Home & Garden\Holiday & Seasonal Décor\Christmas & Winter\Ornaments". The seller is "rokehomegoods" and is located in Multiple Locations. This item can be shipped to United States, Canada, United Kingdom, Denmark, Romania, Slovakia, Bulgaria, Czech republic, Finland, Hungary, Latvia, Lithuania, Malta, Estonia, Australia, Greece, Portugal, Cyprus, Slovenia, Japan, China, Sweden, South Korea, Indonesia, Taiwan, South africa, Thailand, Belgium, France, Hong Kong, Ireland, Netherlands, Poland, Spain, Italy, Germany, Austria, Russian federation, Israel, Mexico, New Zealand, Philippines, Singapore, Switzerland, Norway, Saudi arabia, Ukraine, United arab emirates, Qatar, Kuwait, Bahrain, Croatia, Malaysia, Brazil, Chile, Colombia, Costa rica, Dominican republic, Panama, Trinidad and tobago, Guatemala, El salvador, Honduras, Jamaica, Antigua and barbuda, Aruba, Belize, Dominica, Grenada, Saint kitts and nevis, Saint lucia, Montserrat, Turks and caicos islands, Barbados, Bangladesh, Bermuda, Brunei darussalam, Bolivia, Ecuador, Egypt, French guiana, Guernsey, Gibraltar, Guadeloupe, Iceland, Jersey, Jordan, Cambodia, Cayman islands, Liechtenstein, Sri lanka, Luxembourg, Monaco, Macao, Martinique, Maldives, Nicaragua, Oman, Peru, Pakistan, Paraguay, Reunion.